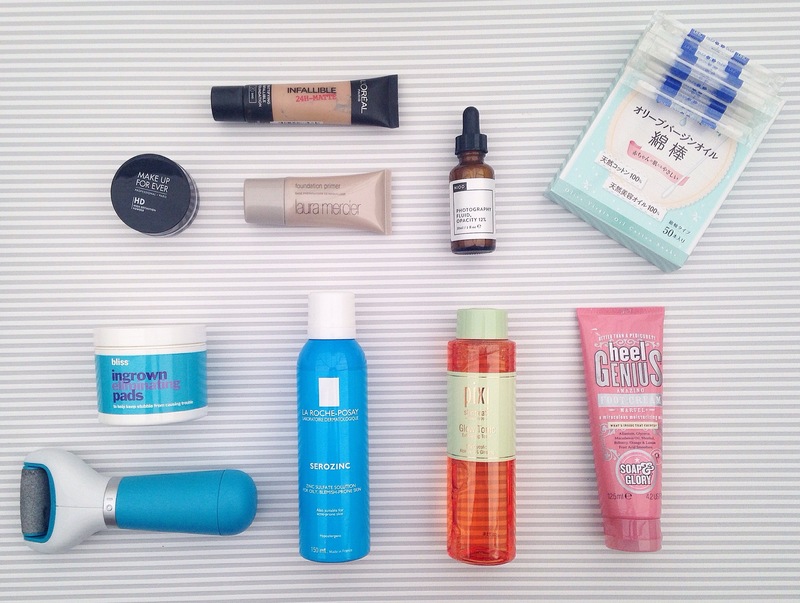 It’s monthly favourites time! Here are the items I’ve been using and loving this month. Laura Mercier Foundation Primer, £29, available here. Something that I’ve had in my stash for a while now (I have the 30ml travel size that I received in a Beauty Box quite a while ago) but have only started to use this month but I’m already a serious fan of this primer. I normally opt for mattifying primers for oil control, which this isn’t marketed as, but so far it seems to be doing a really good job for me – especially when paired with a matte foundation. This primer feels light and silky on the skin. It evens out the skin beautifully before you apply your base – my foundation definitely has an improved wear time when I use this and just all round feels smoother on my skin. L’Oreal Infallible 24hr-Matte Foundation, £7.99, available here. Light weight, matte, decent medium to full coverage and super affordable. The formula of this foundation is fantastic. It applies really smoothly and is easy to blend. I’ve only been using this for the last couple of weeks but I haven’t even been tempted to reach for any of other foundations – my skin has improved quite a lot this month so I find this provides enough coverage that I don’t need to use concealer, it feels really comfortable on the skin, seems to do a good job and controlling any shine or oiliness and has an excellent wear time. Make Up For Ever HD Powder, £22, available here. I’ve had this for a while but just hadn’t given it a try yet. Not anymore. This is fast becoming a make-up bag staple for me. I have the mini travel size and am clearly going to have to fork out the full size ASAP. It looks scarily white but is completely translucent on application. This also doesn’t seem to oxidise on the skin like so many powders seem to do on me so I love it for that. The powder gives the skin a very natural finish – it destroys shine but doesn’t leave your skin looking too matte or cakey – and is extremely long lasting. If I apply this for a night out I rarely need to do any touch-up’s. It feels completely weightless on the skin and it’s impossible to see any powdery residue yet makes the enlarged pores I have on my cheeks just seem to completely disappear. I’m in love and wish I’d started using this months ago when I bought it. “A real life Instagram filter for your face” – how could I not buy it? People have raved about this so there isn’t really much I can add, plus this is kind of a difficult product to explain. A lot of the blurb behind it sounds gimmicky, like “light reflecting prisms”, but it does work. I just never paid enough attention in science classes to understand how! I don’t use this on it’s own, I find the texture a little too drying for that, instead I mix this with either a little moisturiser or primer before applying all over the face or, alternatively, after applying my base, I’ll mix this with a little foundation and add this as a highlighter in the usual places (cheekbones, centre of forehead, etc). It’s not remotely glittery, it just adds a lovely ‘lit from within’ glow that looks entirely natural. It’s also great for me as the creamy-yellow tone helps to even out redness, so it helps mask my hyperpigmentation. Less is definitely more with this product – a little really does go a long way – so I imagine the 30ml bottle will last ages. The only negative is, as many others have said, the packaging – it looks beautiful but the dropper isn’t super practical so it can get real messy, real quick. Not that I really care though because it makes my skin look glowily perfect both in pictures and in the flesh. Pixi Glow Tonic, £18, available here. I’ve been using this twice a day this month and it’s given me amazing results. 5% glycolic acid gently exfoliates away dead skin cells along with aloe vera, ginseng and fructose to tighten and brighten the complexion. Within a couple of days I could see a massive difference in the texture of my skin – I’d had quite a few under the skin bumps and they just disappeared. I think it might be witchcraft! I had been a bit sceptical about trying this because it’s so hyped up but, in this case, the hype is totally justified. La Roche-Posay Serozinc Spray, £8.50 available here. Dear Serozinc, where have you been my whole life? I’m using this as my hydrating toner and it’s fantastic. It helps fight breakouts, banish spots and reduce the level of oiliness of my skin. I’ve been using this, along with the Pixi Glow Tonic and Sunday Riley’s Good Genes, this month and my skin has honestly never looked better. I’ve mentioned before I’ve had a really bad patch of hyperpigmentation on my right cheek that has always made me feel super self-conscious so I never leave the house without make-up covering it. This combination of products has honestly worked miracles. My skin is sooooooooo much better. I now wish I’d taken before and after pictures! I’m wearing much less make up on a daily basis as the hyperpigmentation is greatly reduced, my skin texture is AMAZING (oh hey there baby soft skin…) with no more of those horrid under the skin bumps and I feel like there’s hope I might not always have to throw a boat load of concealer on my face before I leave the house soon! Scholl Velvet Smooth Diamond Pedi Electric Hard Skin Remover, £19, available here. It’s something to remove hard skin from your feet so it’s not exactly the most glamorous of products but I love this. It’s amazing at removing any hard skin and isn’t terrifying like those hand held “grater” things you can get! Easy to use, easy to clean and super quick. My feet are so summer ready now, I just need the weather to catch up! These are really expensive if you buy them from places like Boots, I got mine from Amazon in the end because paying £40 just seemed ridiculous, so shop around. For the £19, this is totally worth it. Soap & Glory Heel Genius, £5.50, available here. Can you tell I’ve been trying to de-Winter myself this month?! Heel Genius is, frankly, a bit of a miracle worker. Combined with the Scholl Diamond Pedi above, my feet have never been smoother (well, in recent times. I’m pretty sure my baby feet were adorably soft and smooth!). I’ve been using this two or three times a week by slathering my feet in the cream and then putting a pair of soft socks on to sleep in. Magic stuff. Bliss Ingrown Eliminating Pads (RRP £28), £17.85, available here. These pads are soaked in exfoliating alpha hydroxy and beta hydroxyl acids, along with oat extract, lavender oil and witch hazel to help prevent post waxing or post shaving ingrown hairs. In the spirit of TMI oversharing, I use these on my bikini line and they’re fantastic. Farewell hideous razor bumps! They do give a bit of a sting/tingle the first couple of times you use them (especially if you’re daft enough to make the mistake of using one about nine seconds after shaving like I did…) but it’s nothing unbearable and after the first couple of times I didn’t get that anymore. You do need to use this daily for it to work but, for me, the results were well worth the cost. I used my first tub on a daily basis which basically eliminated any ingrown hairs and razor bumps and have now repurchased (from Amazon because it was so much cheaper) but I only use them as and when needed, either once on the day of shaving / waxing as a preventative measure or if I feel like there is a new ingrown hair or razor bump developing them I use the pads for a few days in a row. DHC Olive Oil Cotton Wool Swabs, £5.95, available here. I am completely addicted to these. They’re brilliant to take away with you as they’re individually wrapped and are brilliant for cleaning up any make-up errors, particularly eye make-up (mascara splodges and wonky eyeliner being my two most common disasters! ), without ruining the rest of your make-up. I wouldn’t be without these now and always have a couple in my handbag make-up bag. Infused with olive oil, they’re gentle on the skin, non irritating and just moist enough to clean up make-up mistakes without taking all the rest of your make-up with it. Apparently they’re also great to use for conditioning your cuticles so I’ll have to give that a go. What have you been using and loving last month? I use my makeup forever hd powder daily! Totally a staple for me too.